Do you think you have what it takes to run a Valencia Campus for a day? Prep your resume because you are about to compete with Valencia students from Osceola, Lake Nona, and Poinciana campuses for the highest position – Campus President. 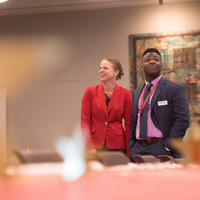 The selected candidate will shadow Dr. Kathleen Plinske, executive vice president and provost of Valencia College, for a day on Friday, April 12. All candidates will receive feedback on their job application process, so that they will be better prepared for their real life job search in the future.